Agoseris glauca var. dasycephala (Pursh) Raf. (Torr. & A. Gray) Jeps. Perennial from a long, heavy taproot; stems leafless, 1-several, exuding milky juice when broken, 10-70 cm tall. All basal, extremely variable, linear to broadly lanceolate, 5-35 cm long, 1-30 mm wide, entire or toothed to laciniate-pinnatifid or few lobed, glaucous or glabrous or sparsely hairy on the margins and midribs below. 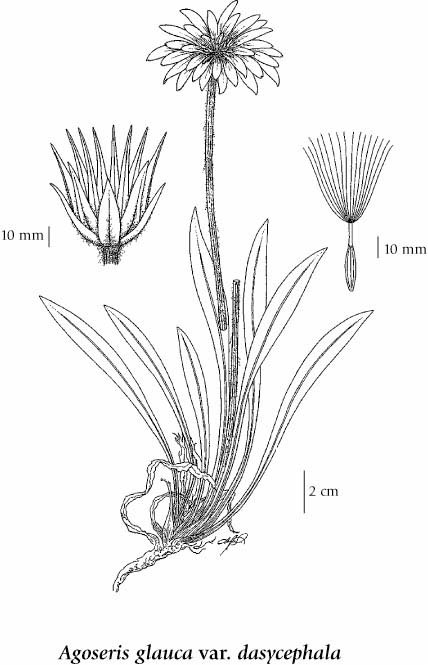 Heads with strap-shaped flowers, solitary; involucres narrowly bell-shaped, 1-3 cm tall; involucral bracts graduated or subequal, lanceolate, attenuate or sometimes obtuse, frequently purple-margined, glabrous, the outer series shorter; receptacles naked; ray flowers yellow, often drying pinkish. Achenes smooth, long, the body tapering gradually to a stout, grooved beak which is about half as long as the body or, as in ours, more commonly beakless; pappus of numerous hairlike bristles, 10-12 mm long, white. Mesic to dry grasslands, shrublands, open forests, meadows and scree slopes in the steppe to alpine zones; frequent throughout BC except rare in coastal BC; N to SE AK, E to AB and S to ID, MT and WA.